Klassik Heute 9/10/10 November 2012. The unique combination of ‘Russian’ melancholy and urbane elegance, exuberant melodies and opulent harmonies has given Sergei Rachmaninov's Second and Third Piano Concertos an undying popularity. These were the works that made Rachmaninov famous, both as performer and composer, and which became the yardstick against which his other works were measured. Less frequently programmed are the two concertos that frame them. Piano Concerto No.1 was written in 1890–91 while Rachmaninov was still a student at the Moscow Conservatory, but didn’t become widely known before extensive revisions in 1917. This was shortly before the composer left Russia for good as a consequence of the revolution, and during his first years of exile, Rachmaninov kept busy as a touring performer – often of his own works – with very little time for composing. Only in 1926 did he launch into a new large-scale composition: the Fourth Piano Concerto. With the audience expecting a work in the vein of the two preceding concertos, the first performance was not a success, however. The work was criticized for being difficult, and the lack of those ‘big tunes’ that had become a Rachmaninov trademark was bemoaned. The self-critical composer immediately started revising the work, and later withdrew it. He returned to it only in 1941 when he produced the version which is usually performed today. After the disappointment of the Fourth Concerto another long silence ensued; not until 1934 did Rachmaninov venture to compose another large-scale work, the Rhapsody on a Theme of Paganini, Op.43. This time the reception was enthusiastic and the Paganini Rhapsody remains one of his most popular works, in which the famous A minor theme of Paganini’s 24th Caprice for solo violin is made to yield breathtaking results. 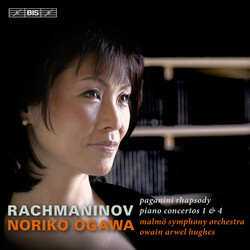 Noriko Ogawa has previously released the Piano Concertos Nos 2 and 3, with the same conductor and orchestra – a disc which received a warm reception, for instance in Fanfare: ‘Magnificent, beautifully refined performances… with remarkably sophisticated support provided by Arwel Hughes and the excellent Malmö orchestra’.